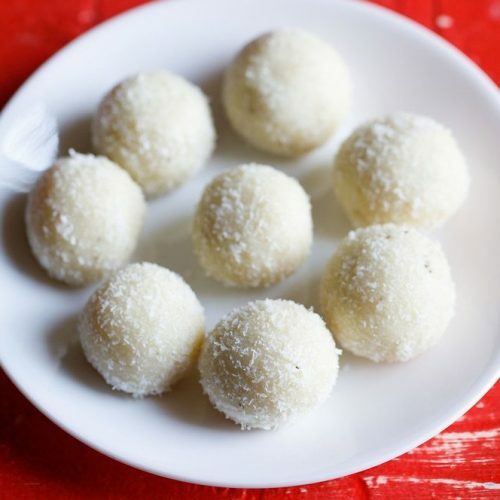 instant coconut ladoo recipe with milkmaid - 2 ingredient quick and delicious ladoos made with milkmaid and desiccated coconut. keep a heavy bottomed pan or kadai on stove top. add 1 tablespoon ghee and let it melt. keep the flame to a low and then add 2.5 cups desiccated coconut powder. on a low flame, saute the coconut for 1 minute. then add 1 cup condensed milk. mix the condensed milk very well with the coconut. on a low to medium-low flame with non stop stirring saute the mixture till it starts to leave sides of pan. then switch off the flame and add cardamom powder. let the mixture become warm or cool down at room temperature. then with a spoon, scoop out the ladoo mixture and shape in round ladoos. in a plate take 3 tablespoons desiccated coconut. roll the coconut ladoo in desiccated coconut. make all coconut ladoos this way. scrape of all the mixture from the pan with a spoon and use them too to make ladoos. serve instant coconut ladoos as a sweet. the remaining ladoos you can refigerate and these stay good for about 10 to 12 days. cardamom powder can be skipped. dry fruits and nuts can be added. for lesser sweet taste add ¾ cup of condensed milk.